Vivid yellow concertina-shaped growths of the rare species Gartrellite, with Azurite crystals and a group of Bayldonite with very well defined faces and edges which is very rare. We’ll send a copy of the analysis of the Gartrellite and the Bayldonite. A major specimen. 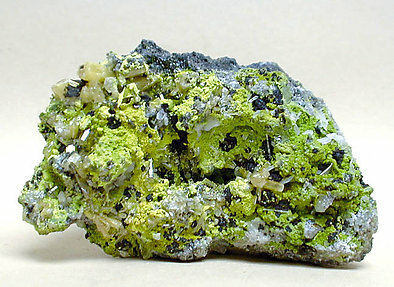 Gartrellite is a mineral species that was recently discovered (1990) and its presentation up until now is not that great under common esthetic standards. Usually it is presented as dull crusts of fine-grained coatings, cryptocrystalline or as incrustations, so basically not beautiful. One specimen from Oliete's collection was labeled as Arsentsumebite, but I was suspicious that it wasn't. I ordered a double X-ray and difractometry test and the result was Gartrellite: bingo! 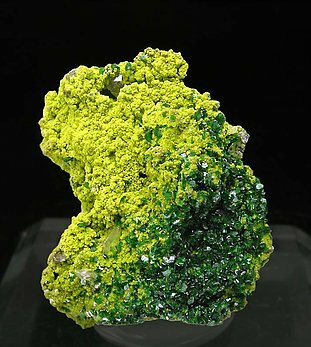 This particular specimen is probably one of the world's nicest Gartrellite and it is shown for first time to the mineral world in this update. Gemmy minor Mimetites are also present, completing a world class specimen.